Honor® Show Chow® Flex Lamb TXT B30 is a highly-palatable, textured feed designed as a Starter/Grower/Finisher for show lambs, replacement ewe lambs, rams and the entire breeding herd. 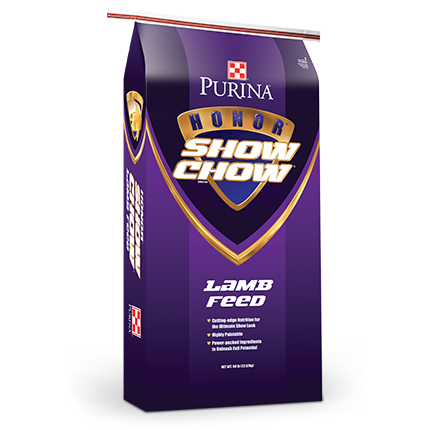 Honor® Show Chow® Flex Lamb TXT B30 feed is supported by Purina knowledge, experience, and research. Get your animals on Flex Lamb TXT B30 today, so they can reach their full potential. Amaferm® A natural feed additive resulting from a proprietary multi-step fermentation process of a proprietary strain of Aspergillus oryzae. Honor® Show Chow® Flex Lamb TXT B30 feed is designed to be fed continuously at a rate of 1 4o 4.65 lb/day to provide 15 - 70 mg lasalocid per head/per day depending on body weight. Always allow free access to clean, fresh water.